The inspiration for this year\\\\\\'s woman winter collection comes from a deep look into the archive with its numerous photos and sample items from almost eight decades of brand history. „Such a rich tradition should not only be celebrated but also quoted“, says designer Konrad Huber. It requires much more than recycling old trends: „It’s about following your instincts and creating your own voice.“ And to use this to get back in touch with the core of the Bogner brand - just as it was once defined by Maria Bogner. In the process, a very modern collection was created that cleverly combines sixties retro quotes, modern shapes as well as sporty details and casual materials. The basic simplicity is appealing and gives the traditional outdoor fashion an up-todate twist. All items are instant classics such as the famous „Tatra“ quilted jacket from the 60s, reinvented in a slimmer cut. Or the cozy sweater in beige with the legendary signature „B“ zipper in the back invented by Maria Bogner herself. Concentrating on the basics with no frills and no compromises– or simply: pure Bogner. Sports and elegance is a combination that Maria Bogner made highly popular. Just because an item is functional doesn\\\\\\\'t necessarily mean it can\\\\\\\'t have an appealing look. By the way, she made a slim pair of ski pants called "the bogner" popular. This term can even be found in English language dictionaries today. Also the newest sunglasses collection by Bogner was influenced by Maria\\\\\\\'s personal favorites. The capsule collection focuses on jackets and coats, pea coats, anoraks, light down jackets and trench coats – all available in a variety of lengths and widths. An anorak with a voluminous back sides with a pea coat that gets its modern look from a touch of asymmetry and a knife pleat. Narrow Techno trousers with foot-straps, an A-line skirt with a single pleat and signature jumpers like the roll neck complete the look. 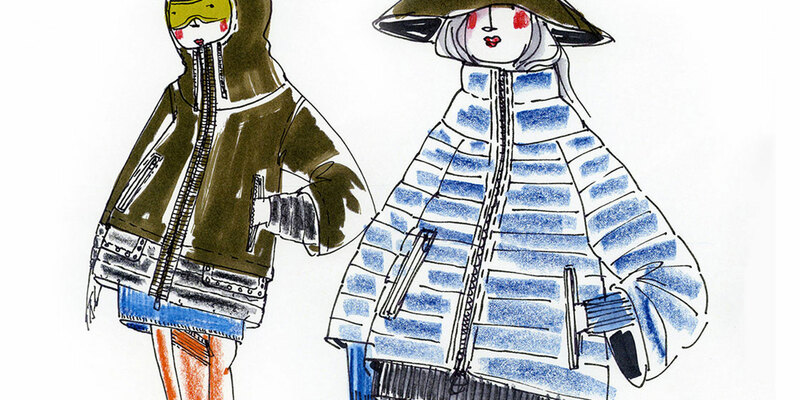 Highlight pieces including a duffle coat made of printed goat skin, and light down jackets and patchwork wool and down jackets complete the theme.